Google users saw outages of services including Gmail and Drive in Australia and throughout the region on Wednesday. The web giant said in a status advisory that it is “investigating reports of an issue with Gmail”, Drive and other services. “Affected users are able to access Gmail, but are seeing error messages, high latency, and/or other unexpected behaviour,” Google said. The company later said that "users will have issues accessing or attaching files in various products." "This includes Gmail and Drive. Gmail: Attaching or accessing attachments, as well as accessing and saving draft emails and sending emails. Drive: Upload and download of files," it said. The problems started at about 1.53pm AEST and were finally resolved at 5.13pm. 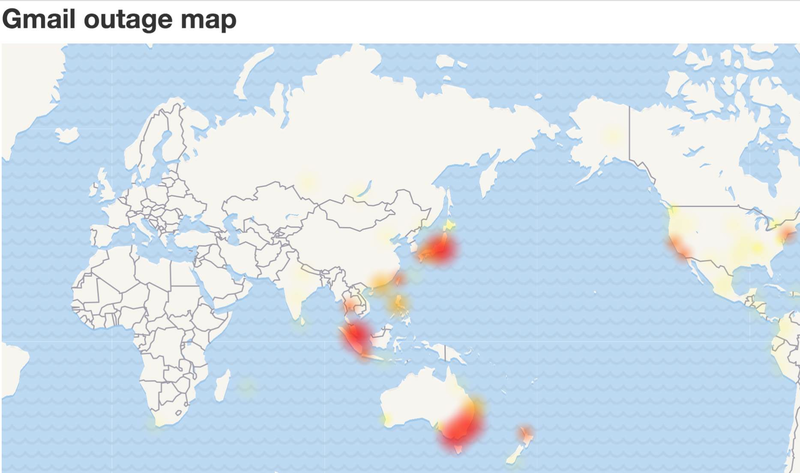 An outage heatmap showed extensive problems being experienced on Australia’s east coast, as well as in Asia Pacific regional centres like Singapore and Japan. Google also said it was seeing increased error rates on Google cloud storage, and with Google App Engine. The company apologised for the problems and indicated it would look at solutions to improve reliability. "We apologise for the inconvenience and thank you for your patience and continued support," it said. "Please rest assured that system reliability is a top priority at Google, and we are making continuous improvements to make our systems better."